Hurricane Sandy has caused so much damage to the New York City power grid and subway system that it could take weeks, even months, for it all to get back to running smoothly. In what could be considered more fortunate news, the state actually does have a plan to revolutionize New York’s power grid, making it one of the cleanest, safest, and smartest in the United States. Could this devastation be a good window of opportunity to get started on these significant changes? The comprehensive plan, known as the Energy Highway Blueprint, was announced in January. It has several goals including adding 3.2 gigawatts of new, clean energy generation and transmission capacity to the state grid through $5.7 billion worth of public and private investments. The plan will use $1.5 billion to modernize inefficient, high-emission power plants and create 750 megawatts of clean power; $1.3 billion to improve transmission and distribution infrastructure; $1 billion to build a gigawatt of transmission capacity; a billion to generate 1.2 gigawatts of additional capacity to replace the power met by soon-to-retire power plants; $250 million in new technologies such as an advanced energy management control center, and $250 million for new renewable energy projects. This even allows for the creation 270 megawatts of new power capacity. Not only will this boost the economy and create thousands of new jobs in the clean energy sector, but it will help put New York in a position that strengthens their grid and allows them to better handle extreme weather conditions. 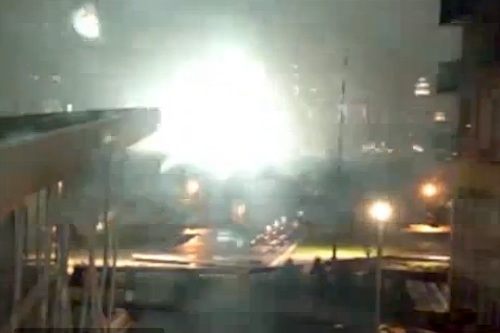 Below is a video of an explosion at a electricity substation in New York City during Sandy. Would anybody argue there is no time like the present to get started on a better future for New York’s power grid?